Christen Risner attacks the Greenup defense in Wheelerburg’s 10-0 victory. David Woodring gets a shot on goal against Greenup in Wheelersburg’s 10-0 victory Tuesday night. 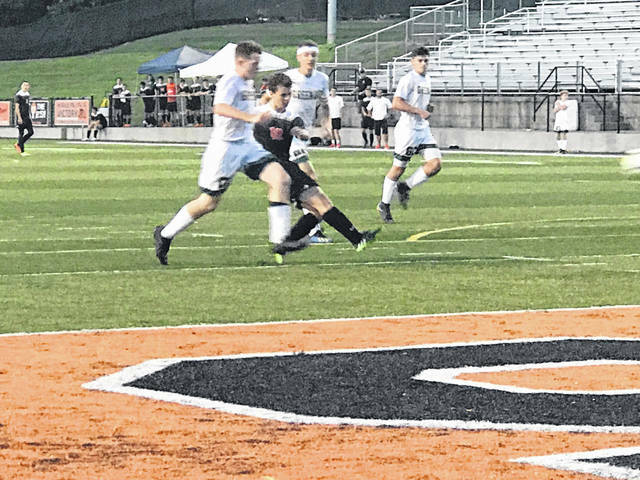 The Wheelersburg Pirates boys’ and girls’ soccer teams both defeated the Greenup County Musketeers 10-0 at Ed Miller Stadium in Wheelersburg late Tuesday evening. In the girls’ soccer matchup, the game began with a slow ten minute stretch for both teams, but quickly opened up in favor of the Pirates in the following few minutes. Junior Sydney Spence began the scoring outburst for Wheelersburg with 31 minutes left in the first half. The scoring wouldn’t stop there for the Pirates as senior Libby Miller was determined to leave her mark on the game. In the 29th minute of Tuesday night’s game, Miller scored her first goal followed by her second goal just over a minute later. Miller completed her hat trick with 22 minutes left in the first half, giving her three goals in a seven minute stretch. The Pirates would go on to add three more goals before halftime, extending their lead to 7-0 at the intermission. 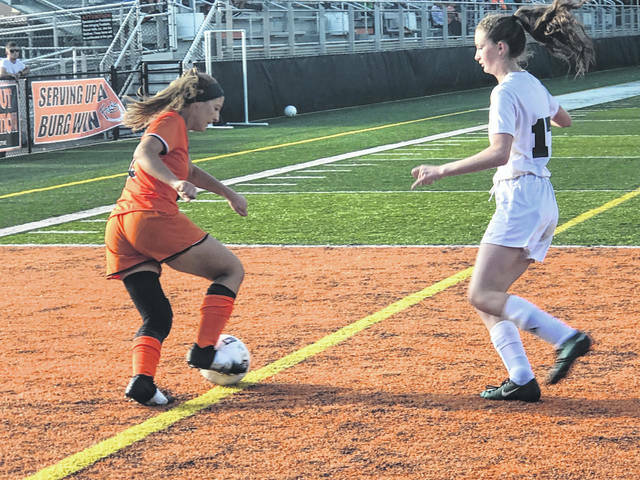 Wheelersburg would score three more goals in the running clock second half finalizing the girls’ matchup in the first leg of the double header with the Pirates winning by a final score of 10-0. In the second game of Tuesday night’s double header, tempers flared among both sides late in the second half when the game was out of reach for the Musketeers. To start the game, David Woodring scored for Wheelersburg putting them in the driver’s seat for the rest of the game. Although the Pirates offensive attack was able to score ten goals against Greenup, it felt like a closer contest throughout thanks to rather impressive goal keeping by Musketeer senior Drew Nickel. The game would remain tied at 1-0 until late in the first half. With just over ten minutes left in the first half, Wheelersburg senior Cameron Llewellyn scored two goals in a matter of thirty seconds including one header goal that went past the Greenup goalie after a collision among the two. Wheelersburg continued their offensive attack thanks to two goals by Pirates junior Will Darling, and also David Woodring scored his second goal of the game early in the first half putting the Pirates ahead 7-0. The game would end in a running clock second half by a final score of 10-0, just the same as the girls’ game, in favor of Wheelersburg. Both Wheelersburg boys’ and girls’ teams appear poised to challenge their SOC II opponents for this year’s golden ball trophy.